west influence – Good bye Lenin! In the Film Goodbye Lenin, Christiana Kerner—the mother of Alex and Ariane—falls into a coma after witnessing her son at an anti-government rally, herself a strong advocate of Socialism and a political activist. Soon after Christiana falls into her coma, the Berlin Wall is taken down. With each newly dismantled piece of brick and dust, a new way of life enters East Germany. This event was one of historical significance and a great deal of fame in fact. The wave of change which swept over East Germany at this time brought a new social, political, and economic landscape. 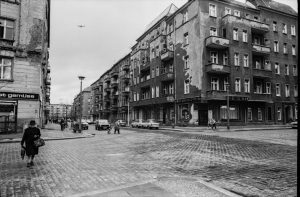 The residents in East Germany were suddenly overwhelmed with new rights such as the right to vote for a plethora of political parties, freedom of speech, and freedom of movement. They were free to join trade unions, to insist on better working conditions and better pay. The media including television, radio, and newspaper were no longer censored nor controlled by the state. Secret police no longer roamed the streets and political prisoners were not taken any more. But of course such a distinct change was not without its issues. While all citizens were now free, they were not necessarily better off. The replacement of Soviet aid with capitalism meant a great deal of job loss and higher unemployment. The society security payments and welfare plans of old were reduced. Those specialists once highly regarded and highly paid by the communist state, including sports individuals, artists, scientists, and academics, were no longer paid. The government was unable to afford a large police force or army which meant an increase in political violence and crime. Christiana’s generation relished the East German lifestyle, but the younger generation including her son were not interested. They no longer cared about politics and sought capitalism with open arms. In the film, Alex struggled to keep the ideology of the GDR alive for his mother, especially when she craved some of her favorite delicacies like Globus Peas or Spreewald Pickels both of which were nearly impossible to find in the increasingly westernized supermarkets. The GDR products were devalued immediately by the introduction of western commodities, a legitimate glimpse into the historical turn of events, and they were equally despised by Ariane and Alex. This caused emotional value to intrinsically develop to these products, products to which the mother clung and products the children hated. Ariane, for example, wants to move beyond the old Eastern lifestyle by getting a western boyfriend and a job at Burger King. Without the restrictions of communication, Alex and Ariane were able to take advantage of the richness brought about by the west. With their mother still confined to her bed following her waking from a coma, the two children were able to dress as they wanted and live their lives as they wanted with their mother confined to the East Berlin replicate apartment. Alex and his girlfriend Lara encounter an empty apartment with GDR food and furniture likely left behind when the owners made their way to the west when the wall came down. The two attend a party of young people drinking and dancing, enjoying drugs. This event, while seemingly normal in the West, was unheard of in the East before the wall came down. Of course, these events display the influence of the west without necessarily stating that they are good or bad. One might view the scene of the drugs and partying with disdain at the negative influence of the west while others may praise the freedoms afforded by this change.